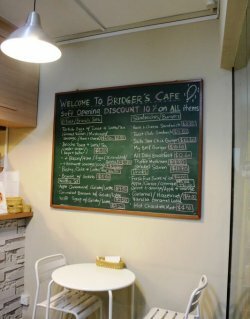 Situated along the river walk of Robertson Quay, Bridger's Cafe is hidden gem as neither many people have heard of it nor been there. Tucked at a quiet corner of Watermark, it was a surprise find for me as I initially wanted to visit Kith Cafe instead that is just next door. However, Kith Cafe decided to close their doors at 7pm sharp on a rainy day and I decided to check out Bridger's Cafe instead. Initially, the owners told me that they are closing soon too but they were very nice to extend their opening hours just for us to fill our empty stomachs. 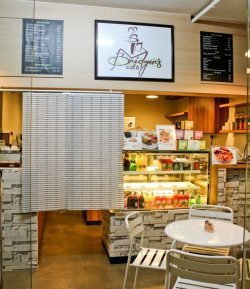 The quaint cafe looks very cosy unlike any other commercialized cafes with seats inside and outside for those who wishes to take in the cool evening breeze by the waterfront. There's a small blackboard inside the cafe too with the menu written on it, giving a very rustic and comfy feel of the entire setting. Looking at it, it allows walk-in customers to have a good gauge of the overall menu here, which is rather affordable. Without further ado, let's find out how the food taste with such an attractive price given the excellent waterfront location! I don't really know how to classify this cafe as they serve a variety of cuisine which the owner says they are good at. The male boss recommended me the Turkish Eggs with Premium Sausages and Mozzarella Cheese ($5.80) which came served in a pan but what's with the aluminum foil? 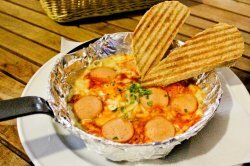 That aside, Turkish eggs actually refers to the ingredients that are topped on it which includes the tasty sausages, tangy tomato sauce and spring onion on cheesy mozzarella omelette. It is served with freshly toasted heart-shaped toast. Yumz! Perfect for an all-day breakfast. 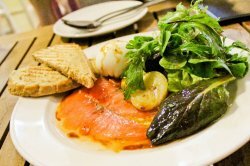 Coming to the Smoked Salmon Carpaccio Salad ($12.50), it was one of the favourite among my fellow diners that night. Thickly sliced smoked salmon slices went so well with fresh crisp greens and toast at the side. Complete with a drizzle of appetizing lemon shoyu dressing, it has a touch of Asian yet keeping it citrus and tangy. Oh, don't forget about the nicely poached egg at the side too which can be requested to be semi-poached for those who like it runny. Perfect light meal on its own! The husband owner of this place told us that the recipe of this Saito San Chix Burger ($14.80) came from a Japanese chef, hence the name "Saito San". The chicken patty of this burger is homemade and stuffed with brie cheese for that, soft, smooth and creamy texture when pan-fried. It was orgasmic when I heard about it as I am a fan of cheese. 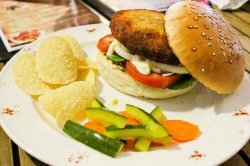 Although the patty don't look too good on the outside, it was delicious with that rustic home-made touch to the entire burger. The food was great overall at this hidden gem with awesome owners who are super lovely and friendly. I can feel that they treat this cafe as their baby by already extending their opening hours for us and ensuring all of us enjoyed our dinner. Excellent thoughtful service which is hard to find around Singapore these days. I'm certainly telling my friends about this place as they deserve more exposure for a cafe with reasonable price and unpretentious quality home-made food!